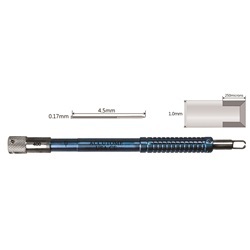 Variety of 1.0mm blade styles mounted in an adjustable micrometer handle. Dual footplate for superior control. 100% titanium handle. 15-Degree Arcuate Blade mounted in an adjustable micrometer handle. Single edge, 45-degree RK Blade mounted in an adjustable micrometer handle. Double edge, 45-degree blade mounted in an adjustable micrometer handle. Tri-Square (Triple 90) Blade mounted in an adjustable micrometer handle. Tri-Square (Triple 90) Blade mounted in an adjustable micrometer handle. 250 micron cutting depth.